The inspiration behind the song ‘Little Susie‘ may have come from an artist called Gottfried Helnwein. Michael very much admired this artist’s work and had purchased some of his paintings. One of them, ‘Beautiful Victim‘, may have inspired the song, along with Michael’s own childhood. Helnwein is is considered quite provocative as he paints about the human condition depicting wounded children among other things — and Michael, being as sensitive as he was to the plight of abused, neglected and deprived children and having been one himself, was apparently very touched by Helnwein’s work. Helnwein’s photograph titled “Lichtkind” or “Child of Light” recreates a crime scene, in which an unidentified child’s body lays on a decaying wooden floor, a lone penny positioned beside her. The unconscious child’s head and eyes are heavily bandaged, her dress, seems new and unworn, and recently placed on her tiny frame, while light, seemingly from above, accentuates her wrists and closed eyes. You’ll notice that the ‘Beautiful Victim‘ painting of Helnwein’s, and the artwork included in HIStory for the song ‘Little Susie‘ is very similar. Helnwein later did a portrait of Michael, from the photograph below. The painting that Helnwein did from this photo is copyrighted so I cannot share it here, but it is very similar with a blue tint and is very beautifully done in exacting detail. It had been rumored that Michael found inspiration for the song from the murder of a little girl named ‘Susie‘ in 1972, but may be just that: rumor. The inspiration is more likely from Helnwein’s ‘Beautiful Victim‘ series of paintings. There several in this series – I think around ten but I am unsure as to whether this was a formal series or if this is just an informal grouping. If Michael was moved to write the song about a specific case rather than about abused or neglected children in general, then it’s possible the song was written long before 1993, unlike the other songs on the HIStory album. Also interesting about ‘Little Susie‘ is that Michael used his own variation of the 9th movement of the Durufle Requiem (Pie Jesu) as an introduction. Videos/audio of both the Pie Jesu Requiem Durufle and Little Susie are provided below so that you can hear this. Michael Jackson was more intelligent, well-read, and complex than many people realize, and that he incorporated so many different elements and influences from worldwide art and music into some of his songs, such as this one, is absolutely fascinating. Not only do I think that he is highly intelligent but also outstandingly educated. He is extremely beautiful, fragile and totally unearthly. I always had the feeling that he is not standing on the floor but slightly floating on air. Thematically similar, Michael’s own drawing of a sad and frightened child sitting in the corner of a room crouching against a wall for protection, yet pulled into an outside adult world by a microphone cord, and prematurely forced out of his childhood was also included in the booklet which came with the ‘HIStory Past, Present and Future, Book I‘ album. Unbeknownst to many, apparently Michael had begun work on an instrumental album of classical music with composer and conductor David Michael Frank as he prepared to begin the shows at the O2 in London. Of course the project was left unfinished after Michael’s death. Little Susie (click to play). You will hear that the intro to ‘Little Susie’ is very similar to the ‘Pie Jesu Requiem Durufle’, above. 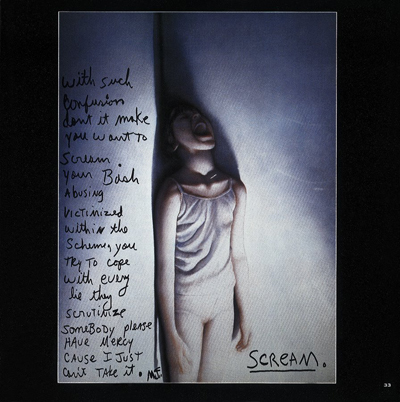 Also in the HIStory booklet is an image by Gottfried Helnwein along with Michael’s handwritten lyrics to the song ‘Scream’. The image is titled: ‘Das Lied‘ [The Song], a watercolor painted by Gottfried in 1981. Gottfried, along with his wife Renate, accompanied Michael and Lisa Marie to Hungary in 1994 where Michael shot the HIStory teaser.